Sapa is a mountainous region, riddled with hills, as well as imposing valleys and rice terraces. It is home to many ethnic minority groups, as well as to some of the most breathtaking landscapes in the world. This furthermost North Vietnam tour includes a visit to the village of Cat Cat and Sin Chai, founded in 19th Century by some ethnic families. Be fascinated by enthralling sights, as women from the ethnic minorities, "desk bound" in front of their looms, toy with imaginative bits of brocade while children run around freely among livestock. The local residents are most well known for their superb jewelry making skills. You will also experience unique customs like the “pulling wife” – one of the most hilarious but rather awkward attractions of Sapa tour. Their traditional houses with 3 rooms housing big families is also an interesting highlight. The Sapa tour will continue to Y Linh Ho, where its natural scenery, combined with unique humane creativity - with structures of mountains, forests, and landscapes – all harmonized perfectly into a single visual masterpiece to behold. Among the attractions of this North Vietnam tour, is the opportunity to meet ethnic groups like H'mong, and to appreciate their striking contrast with other tribal groups. 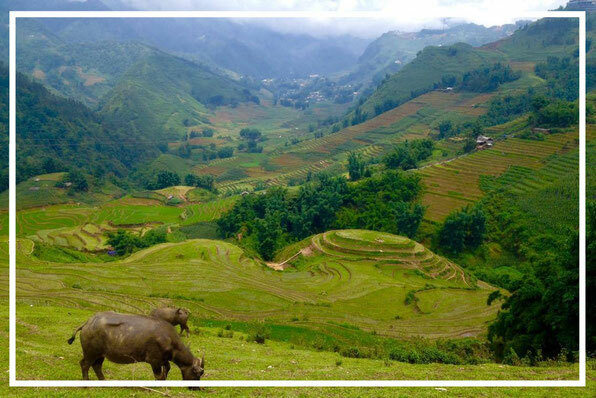 You will also be trekking on the buffalo trails, as well biking on dirt roads en route to the bustling festive markets, most notably Bac Ha and Coc Ly, where you can purchase local produce and handicraft.